(Newser) – You heard it straight from the spacecraft's mouth: "Confirmed: I am in orbit around #Ceres." That was the tweet sent out from the Dawn Mission at 9:37am EST this morning to announce NASA's first spacecraft to arrive at a dwarf planet. 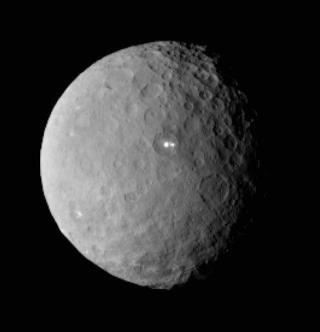 The agency confirmed the Dawn entered Ceres' orbit in the asteroid belt nestled between Mars and Jupiter, the AP reports. A NASA press release says the spacecraft was about 38,000 miles away from Ceres when it was sucked in by the dwarf planet's gravity around 7:39am; the agency's Jet Propulsion Laboratory received a confirmation ping at 8:36am that Dawn was "healthy and thrusting with its ion engine"—a sure sign it achieved orbit. "We feel exhilarated," says Christopher Russell, the spacecraft's lead investigator, per the release. Glad it did not Tweet... I Am in Obit Around URANUS! There ya go ALL!! The article clearly says that the tweet came from the Dawn Mission account, meaning that whoever manages that account sent the tweet. Just because they spoke in first person does not mean they are claiming the spacecraft thought up and sent out a tweet. If you believe that it did, this article probably isn't for you... Although I doubt this it what the author intended, calling an ion thruster high-powered is true when compared to conventional thrusters IF we are talking only about electrical power. A conventional thruster that expels propellant to create a force uses very little power to operate, as the pressurant causes the propellant release. The only electrical power required is to open some valves. An ion thruster is an electric propulsion system that accelerates ions and expels them from the spacecraft creating thrust. Despite its incredibly low thrust, it does require more electrical power to operate. Comparing it to something out of Star Wars is laughable when you think about its thrust level though. That being said, an spacecraft powered by an ion thruster can theoretically reach higher velocities than a conventional spacecraft because it is constantly thrusting, building up momentum over time. It also, however, takes a long time to slow down, so it would need to decelerate over a long period of time as it neared Ceres's sphere of influence.